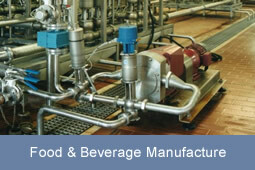 Reliable process monitoring and control is an important aspect of food and drink manufacturing. Continuous water quality measurement may be performed throughout the production process; to manage associated waste streams and to maintain compliance of trade and surface water discharge, across the manufacturing site. Water received from a local water authority or abstracted from a river / site borehole often needs to be monitored to ensure it meets water quality standards and has not been contaminated. The Protoc Total organic Carbon (TOC) analyser has been installed at multiple Drink Manufacturers to continuously monitor towns water for organic loading which can taint the taste of make-up water. In addition to the Protoc TOC analyser, the Proam ammonia monitor has also been installed at Distilleries abstracting river water, to ensure water quality has not been affected by ingress of pollutants such as sewage. The integration of pH and conductivity instrumentation to monitor and control the “Cleaning In Place” process and recover wash water containing acids and alkalis, is well established in the food and beverage sector. The use of pH meters to control dosing of acid and bases is also advantageous. The integration of continuous water quality monitoring in production areas can be used to identify product loss in real time. Instrumentation to monitor drains within bottling plants, after fermenters and post CIP has been used to identify when product loss has occurred. Events can be alarmed in real time by instruments such as the Protoc Total organic Carbon analyser, so corrective action can be immediately taken. Waste-water generated from production often needs to be monitored to ensure compliance to a number of imposed consents which may include flow, pH, suspended solids, ammonia, COD and BOD. The degree of monitoring and the required parameters are often determined by the manufacturing process and the amount of contamination or waste product present. Progressively industry is looking to minimise their waste and reduce their effluent costs by continuously monitoring and treating, prior to trade discharge. The Protoc TOC analyser continuously reports the Total Organic Carbon concentration which provides a good indication of the Chemical Oxygen Demand allowing for real time monitoring and control of waste streams. The Protoc instrument has been installed for a number of leading Brewing companies, Drinks manufacturers, Poultry and Food manufactures to control the treatment process and demonstrate trade discharge compliance. The measurement of pH may also be installed to ensure pH regulation is correctly performed and discharge compliance is maintained. Where treated effluent is discharged to a local water course Ammonia, Suspended Solids (Turbidity) and BOD (Biological Oxygen Demand) may be monitored and controlled in real time, using on-line water quality instrumentation supplied by PPM. Hard standing areas across the site often generate significant surface water which is typically discharged to a local water course. Finished product, waste and fuel ingress in to the site drainage system can affect surface water quality. Continuous water quality measurement may be used to identify pollution events and linked to control systems, to avert discharge of poor surface water quality. Instrument such as the Protoc Total Organic Carbon (TOC) analyser can be used to identify ingress of organic contamination within surface water drainage systems and control abatement systems. If you would like more information relating to this product or the services Pollution PPM can provide, please email TOC@pollution-ppm.co.uk or call +44 (0)1732 882044. PROTOC ® is a fast, reliable and flexible on-line analyser system designed to accurately determine TOC/TC (Total Organic Carbon) concentrations in real time. The TOC analyser comprises a wall mount analyser section typically supplied complete with a controller, providing local display and outputting signals. The 50 Series digital controller accepts multiple sensor inputs for the measurement of key parameters which include pH, turbidity, conductivity, DO and dissolved organics.